Zayn Malik announced that he his leaving his band, One Direction, for good making the fans sad all over the world. The British boyband will have to continue from now on as a four men band and will finish their ‘On the Road Again’ tour until May before their well deserve break. Tears flooded in the Jakarte leg of the tour as the rest of the band announced Malik’s decision to the fans. Harry Styles was seen in tears while on stage as they were performing. 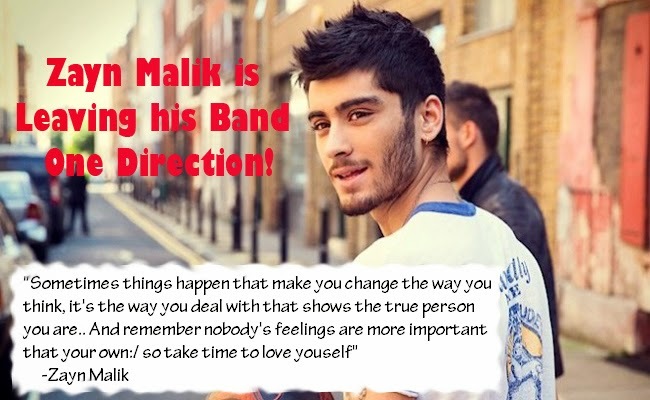 In a statement posted on the One Direction official page, Malik shared that the five years with his band mates had been incredible, yet it is time for him to go. He said that he had made lasting friendships with the other band members that will continue on even if he leaves but Malik wanted to be a normal 22 year old who can have a private life away from the spotlight. Malik apologized to the fans, but he decided according to what he felt is right. Fans expressed various reactions and speculations over Malik’s decision. Some say that Malik’s decision is closely related to the viral photo of him with another girl in Thailand. Two photos had surfaced showing Malik being closed with a girl. Malik is currently engaged with Perrie Edwards of Little Mix and many speculated that he flew back home earlier than planned to save his relationship. Malik was unable to join the band in Manila and Jakarta to fly home and recuperate due to stress, but nobody was able to foresee his decision that he will ultimately leave the band. The rest of the band shared that while it is devastating to lose their friend in the group, their friendship will never be lost and they will support his decision.